Kandi Kudumu Podi is an authentic Vysyas Recipe made with crumbled Toor dal idli & temperings. I am a big fan of this idli upma. When i go to Coimbatore, my Pinni makes this recipe for me. Toor dal is Packed with fiber & proteins, adding the dal in Morning food makes the breakfast healthy & filling. 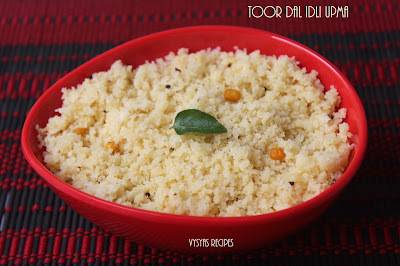 The fermentation process increases the bioavailability of proteins and enhances the vitamin B content of the food.Now we will see the preparation of Toor dal idli Upma. Cooking soda - a Generous Pinch. Soak the idli rice and toor dal together for 4 hours. Then Grind idli rice & dal together with needed salt into coarse paste. Consistency should be idli batter consistency. Allow it to ferment for 8 to 10 hours, now batter is ready. Grease the idli plates, and Spoon the idli plates with batter and steam cook it, for 15 minutes.When the idli's are cooled down, crumble the idli's. Heat the oil in the kadai, add curd chillies & Red chillies, saute till it turns Golden brown and keep it aside. In the same pan, add mustard seeds when it splutters add channadal, urad dal & curry leaves. When dal turns Golden brown colour, add 1/4 cup of water & salt(Adjust). when water starts boiling, add crumbled idli's, Crush the sauted Curd & Red chillies & add to it. Mix well till everything Combines. Serve with any Pickle or Cubed Onions. Always Grind the batter coarsely for Easy Crumbling. Crushing the Chillies gives nice spiciness to Crumbled Idli's. Adding water gives softness to Upma.